Get a comprehensive tour of Ayutthaya in a single day from Bangkok, including round-trip transportation. 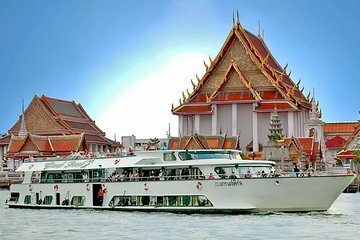 Travel in an air-conditioned vehicle means no need to rent a car; on the way back, you'll travel via relaxing river cruise on the Chao Phraya River. Highlights include Chai Wattanaram, Wat Phrasrisanphet, the Bang Pa-In Summer Palace, and riverside sights in Bangkok on return cruise. Please wait at Hotel Lobby 15 minutes before the time specified on this voucher to start. Driver can be late by 15-30 Minutes due to Traffic or any unwanted clauses. Please note the activity time can be affected by several factors including weather, equipment maintenance or safety protocols. Please always try to update us with room numbers after check-in to Hotel. An additional surcharge for hotel pickup outside 3 miles (5 km) radius from the city center is applicable and payable on the day of your activity.